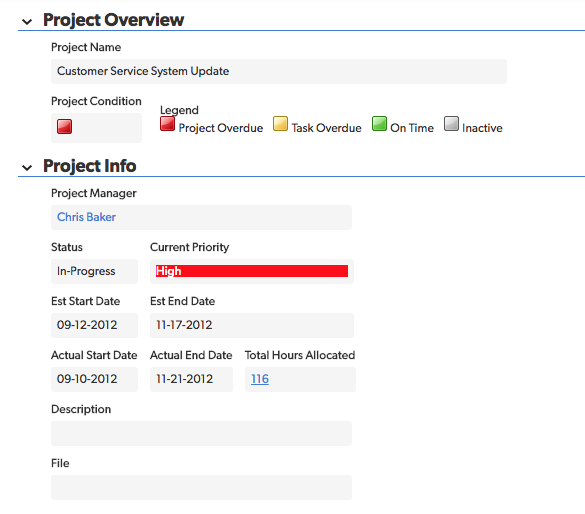 In Quick Base you can About color-coding in reports to a table report, Kanban report, or calendar. You can also color-code individual fields, which can affect reports as well as forms. Color-coded fields in a report. The Current Priority field is a Formula-Rich-Text field. Its conditional formula says: If Priority is Urgent, make the background red. Color-coded field on a form. Create or select a Formula-Rich-Text field. In the Formula box, enter the formula to color code using a <div> tag. See examples in the table below. Add the new Formula Rich-Text field to reports and forms. Tip: You can also color the text in a field instead of the background. Show value from the Priority field with the background always in pink. This code will display the value from the Priority field on a pink background. Show the value from the Priority field. Make the background red only if Priority is Urgent. This formula says: If Priority is urgent, enclose the word "urgent" within a div with a red background. Otherwise, just show the value from the Priority field. Color code each value from the Priority field with various shades of red. Use a Case() function when you're dealing with values in the same field. White text is appropriate for red but not for the other colors.